We have big goals at our studio. We don't aim to just teach the kids a few steps and send them on their way. You'll see that we have some important values that set us apart from other studios. At Rhythms we strive to make everyone feel included; we want our students to feel that the studio is a second home, and that their classmates and teachers are a second family. Each month we host a free Rhythms Night; this is a chance for our dancers (ages 8 to 18) to get together for a themed party. We have had Under the Sea, Outer Space Night, The Princess Ball, Sports Night, Holiday Parties, and even a wedding shower when one of our teachers was getting married and a baby shower when one of our teachers was pregnant. We also try to recognize our students who we feel are excellent role models to our other students and exemplify our values. At our annual year-end slumber party party we announce who the students have voted to be the outstanding dancers of the year. It is a time for all of the dancers to get together and celebrate a great dance season. Our dancers really love being at the studio. They often arrive half an hour early for class just to sit in the hang-out room and chat with their friends and teachers. We love how comfortable our students are and strive to keep Rhythms a fun, happy, and safe environment. Because we offer dance, music and theater, our students become well-rounded performers. They are able to not just foucs on one style, but instead get to take a big variety of different styles. This allows students to avoid getting burnt out on just one specific discipline and is even more fun! Students who love to be on stage can experiment with music, dance and theater or even put it all together in one of our musicals. Our students are not just well rounded performers. We also encourage our students to be strong in academics - almost all of graduating seniors go on to 4 year universities. In the past couple years, our grads have gone on to Cal Berkeley, UCLA, Cal Poly, Chapman and Cal Arts (a performing arts conservatory) to name a few. We love when our students become active members of their community and so we provide many opportunities for them to do community service. Every year students have chances to perform at senior citizen communities, and they love it. We also do the Adopt-A-Family project at the holidays to help families in need. We also let the students get together and vote for one worthy charity they want to raise money for each year. Then, they learn and perform a dance together in the winter recital as the finale while we “pass the hat” through the audience. Over the years, Rhythms students have raised almost $10,000 for charities including Susan G. Komen, Smile Train, and My Healing Harmony. Some studios focus on competition, but we believe there are other, more positive ways to further student's training that are less costly and more fun! We try to give our dancers unique and special learning opportunities. Each year we travel to 1 or 2 dance conventions where students can take classes from master teachers from LA and New York and meet other dancers from around the country. We also organize field trips to see local shows especially at the high schools so our younger dancers can see what kind of performing opportunities might be in their futures. This year we will be taking our company members on a cruise to Mexico where they will perform on a beautiful, professional stage and take amazing master classes. We take these concerns very seriously. We choose costumes, music and themes that will be both fun for the dancers and acceptable to the parents. We also try to keep recital costs low by loaning out costumes instead of having each dancer buy their own. Our usual production fee for shows are between $30 - $70 and our tickets are around $10-$15. At Rhythms, every body type is celebrated! We are passionate about body positivity. In the performing arts world, eating disorders, body shaming, and discrimination are far too prevalent. 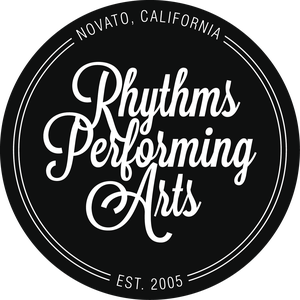 Rhythms believes that we have an opportunity to try to change that norm by teaching our students that performers come in all shapes, sizes, and colors. We host a free club called SLAY (Strong Loving Accepting Young people) that promotes body positivity. The club is run by a certified Body Positive facilitator who is also one of the studio owners. We also choose costumes that are comfortable for all body types. We actively discourage negative body talk around the studio and instead ask students to re-focus attention away from their bodies and toward their inner beauty! Instead of focusing on competition and perfection, our studio aims to help students use performance as a form of self expression. We do lots of in-class activities that help our students to remember that it’s not just about the technique they are learning. Their performance goals should go beyond that. They should be striving to allow performing arts to enrich their lives and give them the ability to express themselves in a very special way! Our musicals always have positive messages woven throughout the show like remembering to be yourself or learning the value of a great friend. We also choose recital themes that reflect our values like Dance Like There's No Tomorrow, Spread Your Wings, and Get Happy!